This book just came into the shop this week. It's a classic, although fairly hard to find. 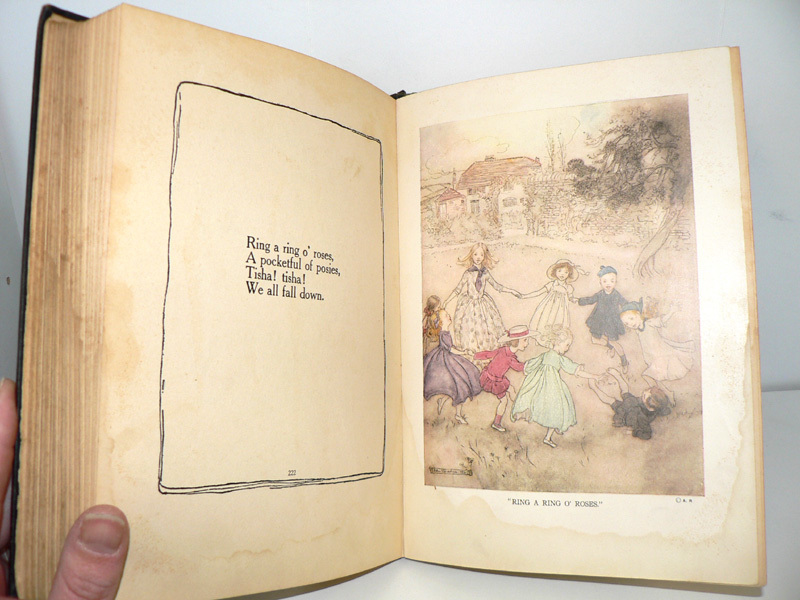 It's a collection of Mother Goose nursery rhymes, illustrations by Arthur Rackham, who's probably best known for his work on Alice. This edition is from 1913. I posted a scan of the cover on Twitter and Tumblr yesterday, and got a terrific response. I had planned on fixing it up a bit before putting it up for sale, but I'll happy to offer it up to you all instead. I love Rackham I have a book of his works but this would be awesome ! One of my favorite memories as a child is my mom reading Mother Goose nursery rhymes to me. This is such a beautiful book! One of my favorite childhood memories is my mother reading Mother Goose nursery rhymes to me. This is such a beautiful book! Please count me in the giveaway. Love it! Wow. This is a super cool prize. I LOVE Mother Goose. Ooooh, I think I saw a copy of this in my grandmother's library! I LOVE Rackham's work. What an amazing and gorgeous book. I love it! Amazingly beautiful. What a great giveaway. What a great collection; I'd love to see all of the illustrations. Mother Goose! Would love to win. It reminds me of many books I grew up with. I'm not that old, but many of my family's books were! Would love to win this treasure. Beautiful book. I would love to win. Love old books! I'm going to be a grandmother soon and now the children's books catch my eye! I want my grandchild to love books as much as I do!! What an adorable book. Please consider me entered, it's gorgeous! This is great!! Would love to add this to our library! Oh, wow. Gotta have this one. I remember sending Rackham Christmas cards when I was in college...so creepy and lovely! I remain unconvinced that "wander" and "gander" are a suitable rhyming couple, but with Rackham's artwork, and the beloved poems of the Goosey Matriarch, I'll happily toss my hat in the ring!! I would like this book, please. Please and thank you for the giveaway! So cool! Thanks for the chance to win it! That is a spectacular book, would be great for a collection we are starting for our son. Mother Goose is timeless and this edition is a treasure. Please count me in. What a wonderful giveaway! He is one of my favorite illustrators. It's beautiful! I love how good the illustrations look after so many years. I would love to add this book to my collection!!!!!!!!! Another great give-away. Throw my comment in the hat. If it be a sin to covet old books, I am the most offending soul alive. (With apologies to Henry V) . Please, enter me in this drawing for that gorgeous old book. I adore Rackham's work. I would love to have this please. Would love to have this on the shelf! Children's day is on Monday, here in my country. It 'd be a perfect present for my daughter! I love Rackham's artwork! Thanks for the great giveaway. Those illustrations are beautiful! Please enter my name in the contest. I'm late, but please count me in! Two of my favorite things. Rackham and fairy tales. Ima gonna leave my comment riiiiiight...here! That's a beautiful book, I'd love to see more! I love it! You always have the best giveaways! 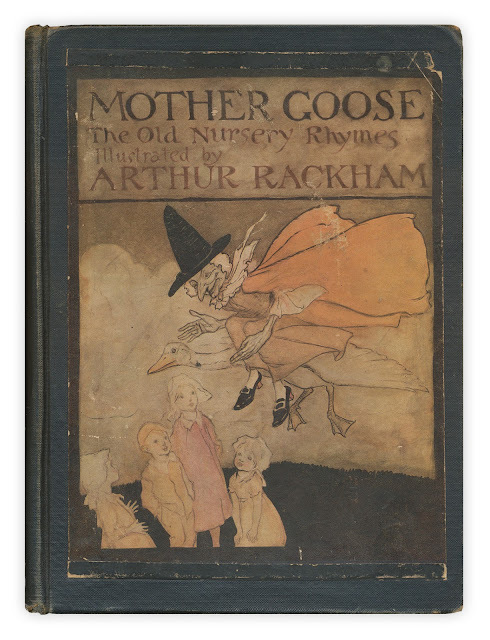 Rackham gives me goosebumps~ and so does this Mother Goose Book. Oh, to be so lucky!! Beautiful !!!!!! I love it ! Enter me, please! Thank you!!! That is so awesome. Must have! memories! I would love to own this book! I remember that cover. My mother's copy entertained her own kids. As far as I know, this volume did not survive the third boy, unlike the battered but rebound "My Bookhouse" standing on the shelves above my desk. A generous offer, sure to please its recipient! This is beautiful. Do want. Oh, gosh, I always love art from this when it comes up on Tumblr. Count me in! I'd like this one...now to teach my little one the appreciation of fine, old things. I am so in! I adore Arthur Rackham's work. Wonderful edition. That would be a great gift to give my soon-to-be first grandchild. The perfect gift for my new baby granddaughter! Love it! Please enter me!